While the results of a DIY bath salt project can differ dramatically depending on your favorite colors and scents, bath salt ingredients are actually pretty simple. There are many ways to tweak a bath salt recipe but you need to first start with a good foundation. Mixing the salts, you should use six parts sea salt to three parts Epsom salts then mix in 1 part baking soda. The combination of salts is useful in soothing tired, sore muscles. The salts can also reduce any inflammation you have in your body. You can swap out the coarse sea salt for dead sea salt, known for its mineral-rich content and effectiveness in relieving muscular pain. The baking soda provides relief for any skin irritations. It also softens the water for a more enjoyable bath. Once your salts and baking soda mixture is complete, you can personalize your bath salts with your favorite scent using essential oils. Mix 30-40 drops of your preferred oil into the dry mixture until well combined. To add even more style to your bath salt recipe, you can use food coloring. The more color drops you add, the darker your salts will appear. Once your homemade bath salts are colored and free of moisture, store them in an air-tight jar or other glass container. If you plan to gift your bath salts to friends and family, consider a uniquely-shaped, clear jar to highlight the natural look and color of your products. 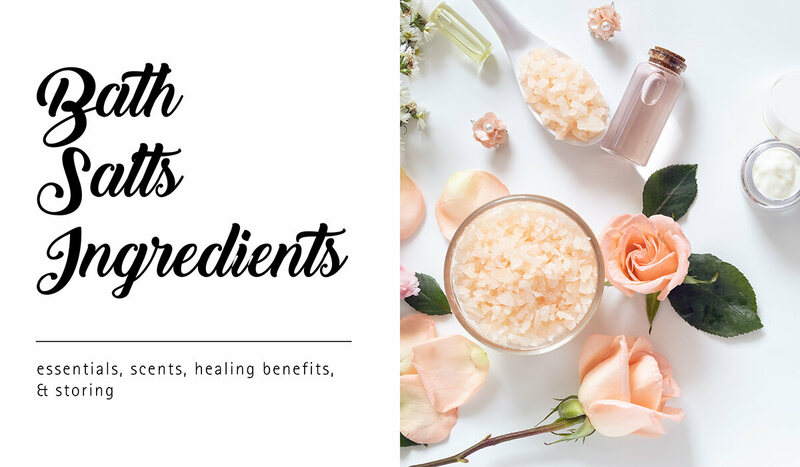 In addition to a perfect color shade, you can really make your bath salts stand out with a wonderful fragrance and the healing benefits of aromatherapy. With so many essential oils on the market today, it can be difficult to choose the right ones for your bath salts. To create a super detoxifying bath salt, consider adding some bentonite clay to your mixture. This type of clay is known for its ability to draw toxins from the body and heal your skin. After you’ve put in the work to make your amazing bath salts, it’s important to have the right container to store your final product in. To maintain a useable, well-protected product, store your bath salts in a durable, air-tight container. A clear, uniquely-shaped glass jar is an ideal way to highlight the color and texture of your bath salt creations. At BottleStore.com, we offer a large selection of affordable bath salt jars and containers in a variety of sizes and styles. You can choose from a wide variety of glass and plastic containers suitable for bath salt storage. Rely on our packaging experts to help you find the right container shape and style to match your product’s brand and image.